*The Climate Lottery is a forecast contest free to play by giving your picks in an e-mail or in this posts comment section. No prizes will be given out for the contest, which is for educational purposes only. The main purpose for the contest is to make people interested in National Center for Environmental Information climate products. The special account that I have set up for the contest is guywalton10@gmail.com. This time I will make a personal pick, following along with any players. The National Center for Environmental Information ranking numbers for average temperatures of the lower 48 states for Spring 2019 will be posted on or shortly after June 7th, 2019 which will be the official “Climate Lottery” numbers of the contest. Any subsequent changes by NCEI after their initial posted rankings will not be valid for the contest…but those ranking numbers will change with time. The winning Climate Lottery numbers for Winter 2018/19 (DEC, NOV, DEC) were 104/97/37 with a Power Ball number of 87 for the season. Hello again to all weather and climate geeks out there. 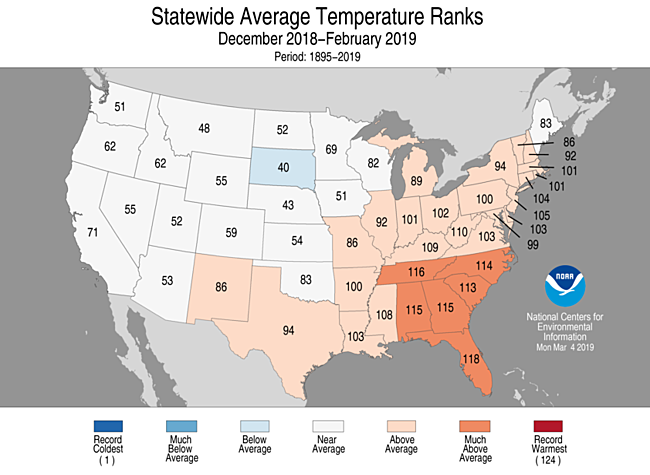 Winter 2018/19 turned out to be a “typical” above average season, temperature wise, for most of the United States. If you wish to play “The Climate Lottery” pick one number between 1 and 125 (with 1 representing the coldest possible ranking and 125 being the highest possible ranking) for March, April, and May 2019. Also, pick a “Power Ball” or overall ranking number for Spring 2019 between 1 and 125. The Power Ball ranking will serve as a tiebreaker for any close picks between contestants. Your picks are NCEI rankings for average temperatures across the lower 48 states. Since 2019 is the 125th year that the National Center for Environmental Information has been ranking years since 1895 all months for 2019 will have a warmest ranking of 125. The year 2019 would be the 125th year. Those rankings for 2019 will have a range from 1 to 125 with the coldest ranking being the number 1. The Power Ball (or overall National Center for Environment Information) number for Spring 2019 for the lower 48 states was 87 which was above the average ranking of 62, for the lower 48 states. In the Climate Lottery game, I’ve defined each individual lottery number as rankings for each month for the lower 48 states, Power Ball numbers as those for each season, and Mega Ball numbers as those for each year. Chances for an entire season of below average temperatures are becoming much less likely across the lower 48 states due to carbon pollution. The whole point of these posts is to demonstrate how skewed temperatures have become towards warmth due to climate change. Of course, as far as the globe goes, the larger an area that is compared to averages, the more likely that area is to be above long term averages. What has happened, so far, this decade is yet more proof of the climate lottery game being loaded for warmth in the United States. Balls coming out of the Climate Lottery hopper are likely to have high numbers, but not for all months of the fall. It is still possible, though, to have a cold, anomalous month as happened in November 2018. 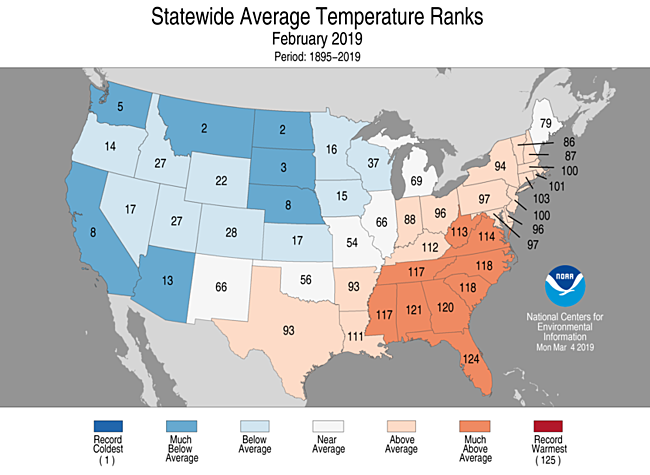 The Southeast had a relatively mild winter while the northern Plains got bitterly cold with plenty of snow, which was much more than average. The West had near average conditions. The following is a breakdown of each month for Winter 2018/19. Each chart shows “Climate Lottery” numbers for each state (or rankings) from a scale of 1 to 125. Practically the entire lower 48 state area had above average temperatures except for Oklahoma, Texas, and the Intermountain West. Above average temperature continued in portions of the East. 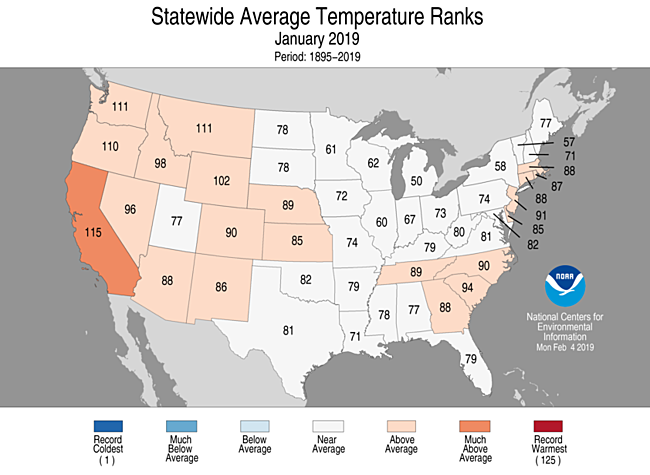 January was relatively the West’s warmest month during the winter. The Midwest began to get colder. In The West became stormy and relatively cold while the Southeast had its warmest month. In my own hometown, Atlanta, the earliest recording of 80F for any year occurred on the 7th. The average ranking for 2018 was 62.5 since the coldest ranking would be 1 and the hottest 125. I have color coded all rankings for this post at or below 42 blue and all those at or above 82 red with rankings + or – 20 from the mean value of 62 black. With time, the rankings for each individual month, season and year will change as more data becomes available from NCEI. Also, for reference, the annual or “Mega Ball” numbers are shown on the chart. 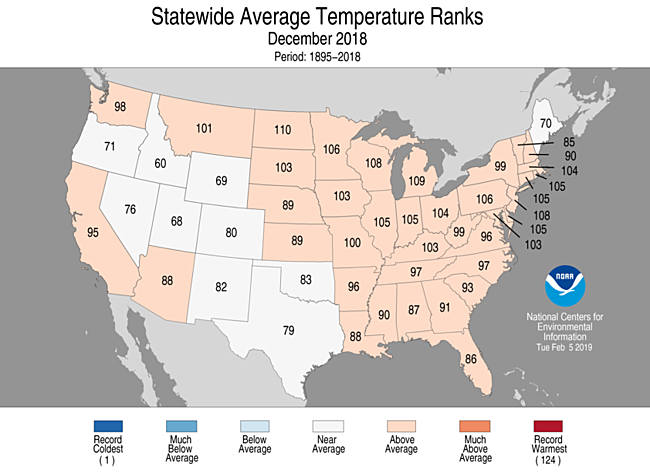 The mega ball number for 2018 was 111 meaning that 2018 was the thirteenth warmest year on record for the lower 48 states. Notice that since the start of 2010 only four out of thirty-seven seasons have been below average or “blue.” Twenty-seven out of thirty-seven seasons since 2010 have been “red” or above average. Indeed, the Climate Lottery hopper is very much loaded for above average temperatures for the lower 48 states looking at recent history. Yes, the “casino of climate averages” is cheating causing the “house of warming” due to carbon pollution to win just about every season. I hope that everyone will have a great spring. Be safe though, and keep abreast of severe weather that also accompanies increased warmth as the landscape sprouts its greenery.